NASA’s Orion spaceship has completed its maiden, unmanned voyage with a splashdown in the Pacific Ocean off Mexico. Drone video sighted the ship descending gently on its parachutes, shortly before it hit the water. US Navy support vessels, with the help of divers, moved in swiftly to recover the floating spacecraft. Orion is designed eventually to take humans beyond the space station, to destinations such as the Moon and Mars. Its brief 4.5-hour flight was intended to test its critical technologies, like the heat shield and those parachutes. 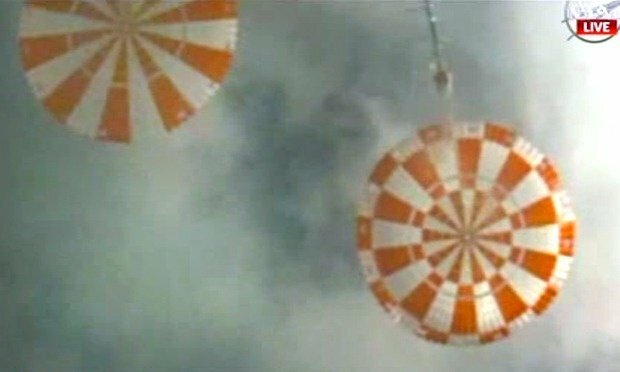 Commentators on NASA’s television channel said the craft had made a “bulls-eye” splashdown. “There’s your new spacecraft, America,” mission control commentator Rob Navias said as the Orion capsule neared the water. Orion was launched on a Delta IV-Heavy rocket from Cape Canaveral in Florida at 07:05 local time. The orange-colored triple booster was quickly lost in cloud after clearing the pad but headed effortlessly east out over the Atlantic for a two-lap circuit of the Earth. It was on the second of those two orbits that the Delta’s upper-stage took Orion up to an altitude of 6,000km, to set up a fast fall back to the planet. The capsule was expected to attain speeds close to 30,000km/h as it entered the atmosphere, with the pressing air likely to have generated temperatures on the ship’s underside of up to 2,000C. This was one of the key aims of the mission – to see how Orion’s thermal protection systems would perform. Engineers will know more when the capsule is recovered and returned to land for inspection. Orion is reminiscent of the Apollo command ships that took men to the Moon in the 60s and 70s, only bigger and with cutting-edge systems. It is being developed alongside a powerful new rocket that will have its own debut in 2017 or 2018. Together, they will form the core capabilities needed to send humans beyond the International Space Station (ISS).